The junior club were formed in the village of Duntocher in 1899, under the name of Duntocher F.C.. This was as the result of a breakaway from another local junior club, Duntocher Hibernian. They changed their name to Clydebank Juniors in 1900 on moving to the town itself. They were based at the original Kilbowie Park prior to the construction of an upgraded ground in 1939. Around about this time they were one of Scotland's leading junior sides, winning the Scottish Junior Cup in 1942 as well as numerous other honours. The club continued in junior football until 1964 when they were controversially merged with senior club East Stirlingshire, to bring Scottish League football back to the town for the first time in over thirty years.They also won the West of Scotland Cup in 1949–50 season captained by centre half Joe Gallagher. 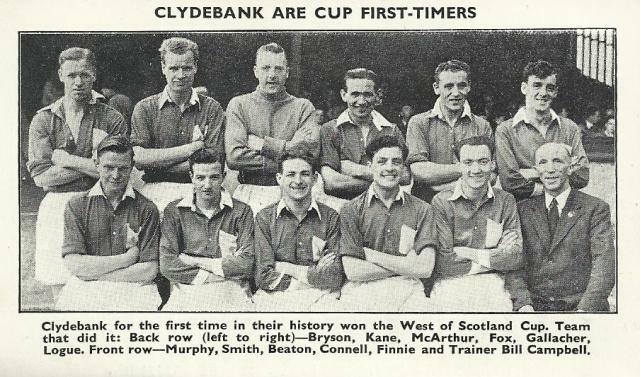 but after two years playing in the Western League they had better fortune when they were elevated directly to the top flight, three clubs from the north and east of the country having been forced to stand down for the duration of the war due to travel difficulties.The economic boost the war had given to Clydebank's shipyards and factories was probably a contributory factor to the local team being chosen to fill the vacancy. The club lasted five seasons before being relegated in 1922. They were immediately promoted back to Division One but relegated again after one season. The economic downturn in the latter half of the 1920s affected the town and the club badly, to the extent that the club considered resigning from league football in 1929. They chose to continue at that time but it proved to be only a stay of execution, with financial difficulties forcing the club to drop out of the League in July 1931. The club were out of football completely within a year. Throughout their existence, they played at Clydeholm Park, which continued to exist after their demise as a venue for greyhound racing up to the 1960s. The most famous player to appear for the club was Jimmy McGrory, the Scottish League's all-time record goalscorer, who spent the 1923–24 season on loan to Clydebank from Celtic, scoring 13 of his 397 career league goals while at Clydeholm. In 1964 the Steedman brothers, owners of East Stirlingshire, controversially merged their club with Clydebank Juniors. The new club (whose name was usually abbreviated to E.S. Clydebank) inherited Shire's place in Division Two, playing home matches at Kilbowie. After a year, a legal challenge by East Stirlingshire supporters led to them resuming their former identity back in Falkirk. The Steedmans elected to remain at Clydebank, establishing a new club at senior level. E.S. Clydebank's single season is generally considered by historians and statisticians as a contiguous part of East Stirlingshire's record, as the merged club was never elected to the SFA or League in its own right. who were still convinced of the potential for senior football in the town despite the abortive merger. Although in many senses a resumption of Clydebank Juniors, albeit at a different level, they were technically a brand new club. Clydebank had to wait a year in the Combined Reserve League competing against Jordanhill Training College, Glasgow Corporation Transport, and the Third XI's of the Old Firm before being elected to the Scottish League in 1966. Becoming the first club to play in all three Scottish League divisions after league reconstruction in 1975. Clydebank also reached the Scottish Cup semi-final in 1990 while playing in the First Division. The club's fortunes began to decline after New Kilbowie was sold by the Steedmans in 1996 and a promised new stadium in the town failed to materialise. Clydebank spent six years playing "home" games at first Boghead Park, Dumbarton, followed by Cappielow Park, Greenock, with the inevitable decline in support. During their time at Boghead Park, the Steedman family sold the club to Dr John Hall, a Bermudan based businessman. Unfortunately, Dr Hall and his fellow shareholders/investors had no interest in Clydebank FC whatsoever. They saw the club merely as a "ticket" to achieve their ambition of owning a club in the Scottish League that would be based in Dublin as Dublin City FC. When the combined efforts of United Clydebank Supporters, the Football Association of Ireland, the Scottish Football Association and the Scottish Football League brought about the rejection of a move to Dublin, the owners made a number of attempts to relocate the club as a franchise to a number of alternative towns - including Galashiels and Carlisle. The club's SFL and SFA identity finally disappeared in 2002, when Airdrie United bought Clydebank's League Membership and took over their place in the League. During the 2002–03 season, the remaining Clydebank supporters were left without a team to follow, the transformation into Airdrie United having happened too close to the beginning of the season to make alternative plans. In the following months, members of the UCS supporters' group met with the purpose of creating a new Clydebank F.C. Airdrie United Ltd agreed to voluntarily transfer their unwanted ownership of the name and insignia of Clydebank F.C. to UCS, and a venue for matches in the Clydebank area was secured following an agreement to ground share with Drumchapel Amateurs at Glenhead Park, Duntocher. 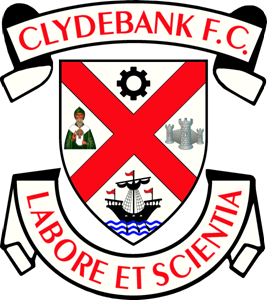 The UCS group re-established Clydebank Football Club in 2003–04, entering the West Region structure of the Scottish Junior Football Association. The club gained promotion from Central League Division Two that season, and in 2004–05 were third in Division One, missing out on a second successive promotion by one point. 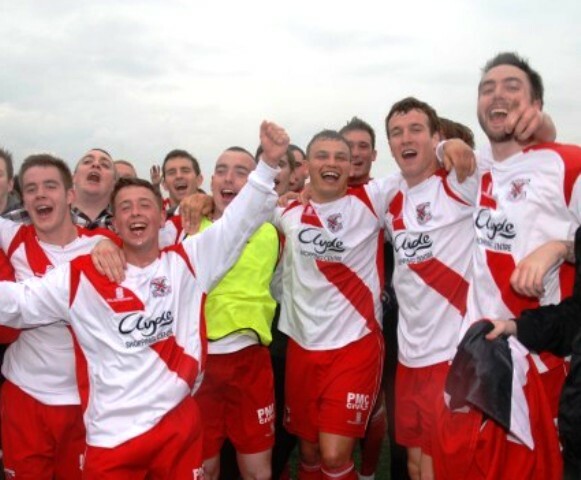 2005–06 saw record crowds since the re-birth of the club, with up to 1,150 watching Clydebank come within penalty kicks of reaching the last four of the Scottish Junior Cup - beaten after two 1–1 draws against Tayport. 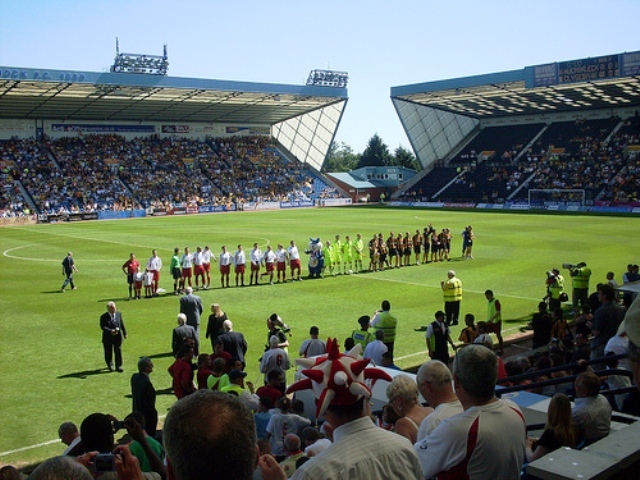 In 2006–07 the club were promoted to Super League Division One. It was announced in June 2008 that Clydebank and Drumchapel had agreed to terminate their ground sharing agreement, with the Bankies moving across the town to share Holm Park with Yoker Athletic. 2008-09 was a great year for Bankies,they reached the Scottish Junior Cup Final at Rugby Park Kilmarnock only to lose narrowly by 2-1 against Cup Kings Auchinleck Talbot. 2009-10 - The Bankies win their first cup final since the rebirth,beating Ashfield 2-0 at Pollok to win the Central League Cup. 2010-11 - After eight years in the Juniors Bankies clinch promotion to the West Super Premier League and next season will play in the Juniors top flight for the first time. 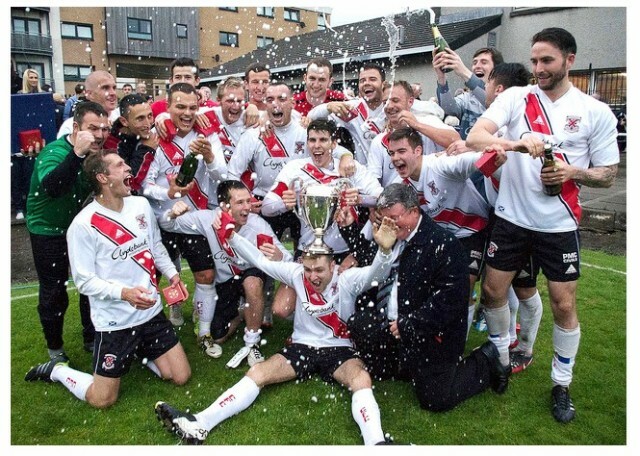 2011-12 - A great first season in the Super Premier League sees Bankies finish in fourth position,their highest since the rebirth and to top the season off they win the Central League Cup for the second time,beating Scottish Cup winners Shotts Bon Accord 3-0 at Pollok.